This open competition for a new theater ticket center in Times Square, received 683 entries from 31 countries. A dynamic architecture for the dynamic city... The theatre’s relationship with the city exaggerates the dynamic and the spontaneous. The city becomes theatre, heightening the sense of spectacle as people interact with an ever more transient environment. A structure promoting the theatre must embody these emotions. Our solution to the brief exists within the realm of the portable, taking cues in both its attention to detail and expression from the automotive and aerospace industries. The building must be a beacon. The gleaming vivid blue shell protects its occupants as well as drawing attention. Through the use of aluminum semi-monocoque construction, the impact on the ground is minimized. A hydraulic arm mounted on the capsule operates a kinetic signage system. During opening hours, a canopy shields customers from the elements. When closed, the canopy can then be drawn down over the glass. Through these various design elements emerges a dynamic, interactive machine. 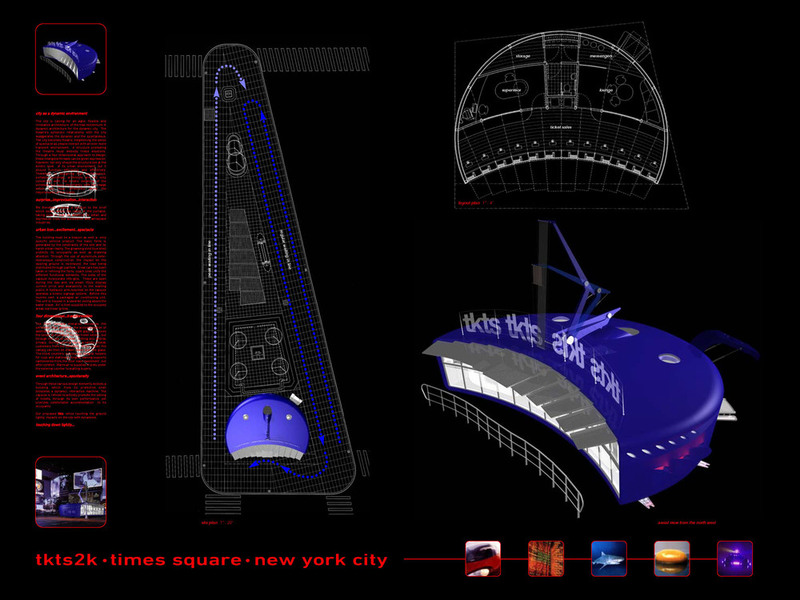 The capsule is designed to actively promote the selling of tickets, through its own performance on the city streets. Project in collaboration with John Ridgett and Richard Morrell.